My secretary is a fun piece of furniture to redecorate. I don't have shelving units anywhere else in my house, so every now and then, I like to tweak the shelves in my secretary. I gave it a summer look by changing just a few things. I changed the pillows in my slipcovered chairs by using this sweet floral pattern. 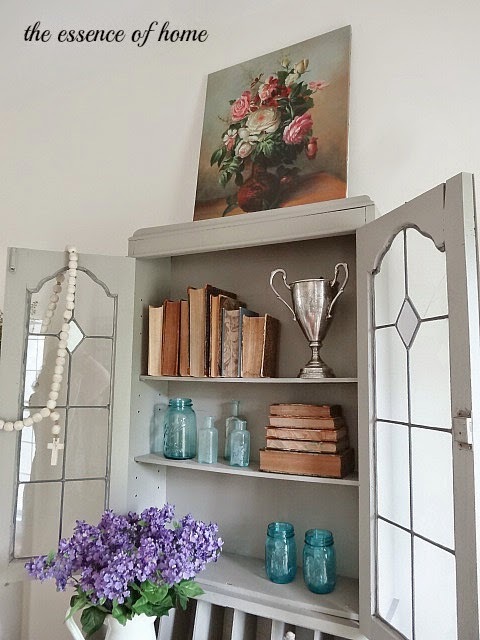 I leaned a floral canvas on top and filled the shelves with old books turned backwards to reveal the old pages. 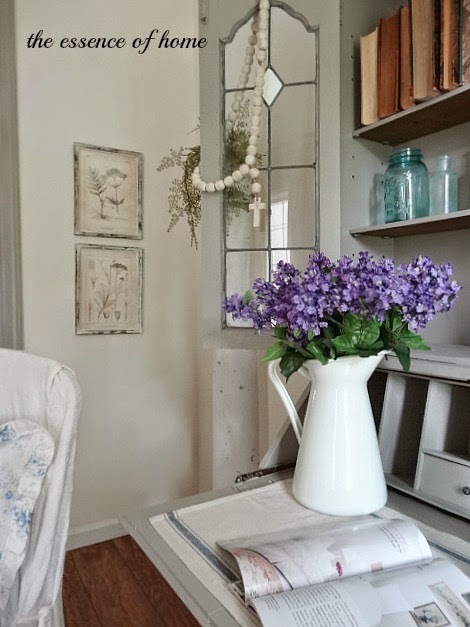 Old blue bottles and mason jars add a pop of color along with some faux purple lilacs. It's light and summery but most of all sweet and simple. Do you have a favorite item that you like to change up displays in too? That looks so good and I love the pillows, too. So pretty. I love the secretary, it is such a lovely piece. 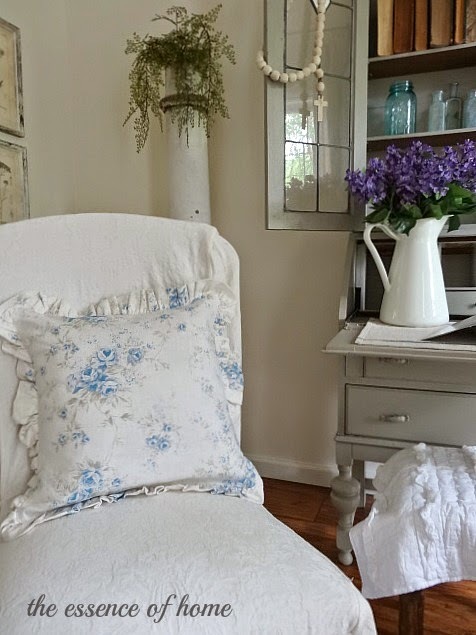 The blue bottles are so pretty and I think the floral pillows are perfect or summer! Your secretary looks so pretty with your new arrangement. Love the blues of the bottles! That's what I like about my kitchen cabinet. I can move things around on top like I would a mantle. It's fun. Mr. H never knows what to expect. I think he's quit paying attention. It drives my kids crazy. 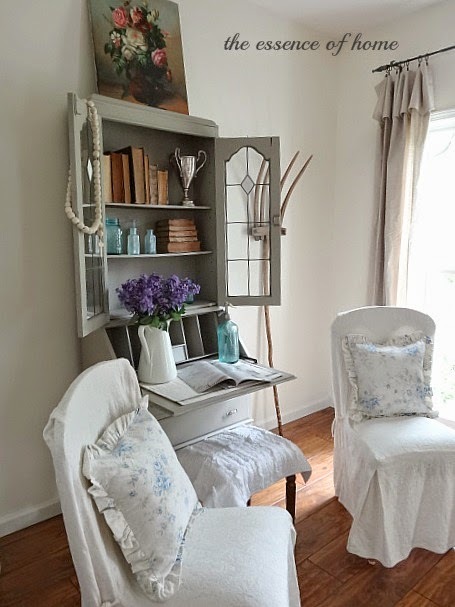 I love the fresh summer look of the secretary…the blue bottles and mason jar really compliment your pillows…so pretty! Very pretty! I love how you turned the books...that really shows their age. I love that blue floral pillow, too! The blue bottles and floral pillows are so summery Kelly. :)perfect pop of colour. I always love your secretary and your adorable jars. So pretty Kelly. I love the pillows and love the blue pops of color with the jars. 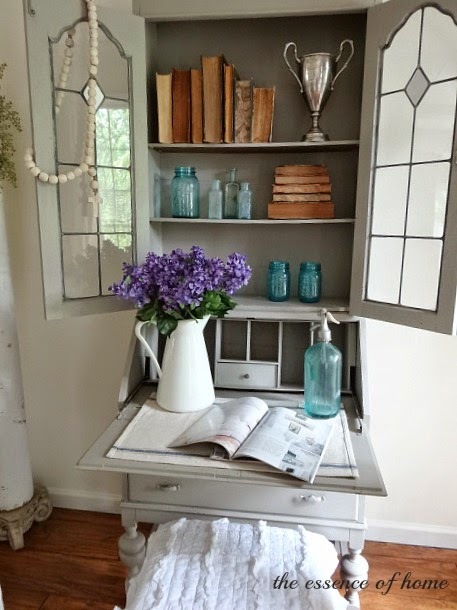 So sweet and you definitely caught the feel of summer in your vignette. Looks great, Kelly! I love the secretary. It is such a versatile piece. What a great piece. I actually have everything you used, so I might just go and restyle a cabinet somewhere myself! I have been wanting to try turning the books backwards to show just the pages, now I think I will! That floral canvas is stunning. Great job! Very pretty, Kelly! I'm loving the old books, and especially the floral canvas! So beautiful Kelly...I love the different textures and the pops of blue...beautiful job!! When we downsized in 1997 to a little tiny beach cottage, I gave most of the large family antiques to my sister. We had a wonderful secretary desk from Steve's family and his brother took it on "loan" stipulating that they would give it back whenever we asked. I would love to have it in our home. BUT, we still do not have the space and Steve would never allow me to paint the walnut wood. If I had it, I would stage it just like yours! It looks great Kelly! I play around with vignettes on my dining table often. I love the old books! They look good in any decor. And the lighter fabrics and colors are perfect for summertime. I have a baker's rack in the lanai that I change up a lot! Hugs! Soooo pretty, Kelly! I really like the books turned backwards. Funny, I was playing around with the table in my entry hall, and used some backwards books! I've been seeing them on display in some stores. I have two secretaries...one is always kept closed, the other with glass doors could use a makeover! thanks for the inspiration! I never thought to turn the books BACKWARDS!!! You are so clever! So beautiful Kelly.I love the pillows and love the blue pops of color .